Do you want to do something for the climate when sending mail? Thanks to the “pro clima” – Shipment option you can, for a few centimes per mail item. Swiss Post invests your contribution in high-value climate protection projects. This is how we offset the unavoidable greenhouse gases created when transporting your mail. Did you know that as early as 2012 Swiss Post was already sending all domestic letters carbon neutrally without any additional charge to the customer? Help us to protect the climate when sending other mail too. You can, thanks to the “pro clima” – Shipment service. It doesn’t matter whether you are sending parcels, catalogues or small consignments within Switzerland, letters abroad, or using overnight logistics or courier services. Thanks to our very energy-efficient logistics, you pay only a few centimes per mail item for the full carbon offsetting. We invest this money in selected climate protection projects. Because the projects help us to produce fewer greenhouse gases, we contribute to protecting the climate. This is good for you too: thanks to the “pro clima” label on your mail, recipients see at a glance that your mail has been sent in an eco-friendly way. Find out about our “pro clima” service for business customers and take a stand for climate protection with your customers. Carbon-neutral mailing protects the environment. Climate protection projects that meet the highest standards both at home and abroad guarantee sustainable development at the project locations. The “pro clima” label identifies carbon-neutral consignments and sends a positive signal to the recipient. Guarantee thanks to auditing by external auditors: your “pro clima” surcharge is fully invested in carbon offsetting. Swiss Post’s carbon offsetting volumes for the previous year are certified. You can communicate this and boost your image. Storage of liquid manure and dung is an agricultural activity, but it does lead to the production of methane, a potent greenhouse gas. Modern biogas plants on Swiss farms (PDF folgt) collect this greenhouse gas and use it to produce heat and electricity – thus turning methane, which is harmful to the climate, into a clean energy source for eco-electricity. Gas and electricity? For many Cambodians gas and electricity cannot be taken for granted. This is why small household-scale private biodigesters in Cambodia PDF folgt) are extremely important, particularly in rural areas. Livestock manure is mixed with water in the biodigesters. This is all it takes to make clean fuel for a better quality of life. Kitchens are smoke-free, the houses have light, and the occupants’ respiratory health is improved. And there are environment benefits too. The biodigesters funded by Swiss Post have reduced year-on-year CO2 emissions in Cambodia by 95,000 tonnes. Swiss Post sends all addressed domestic letters and PromoPost consignments carbon-neutrally and covers the “pro clima” surcharges for offsetting CO2 emissions. 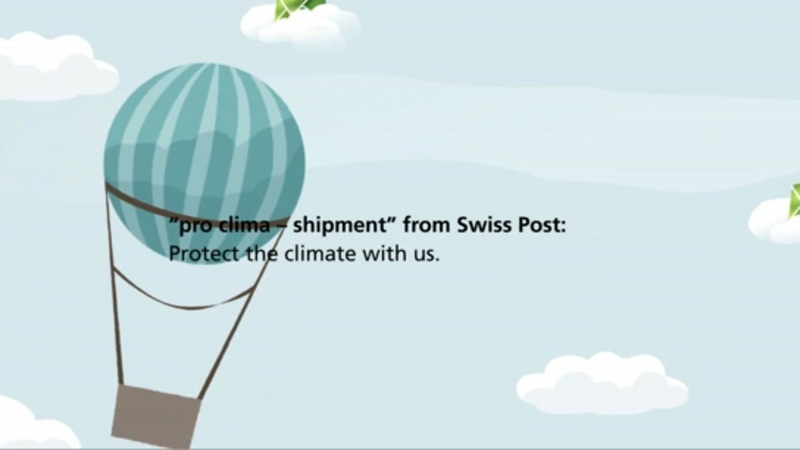 You too can set an example and benefit from Swiss Post’s commitment to climate protection. By sticking a “pro clima” shipment label on your addressed domestic letters or PromoPost consignments, you are increasing your contribution to sustainability. We would be happy to provide you with the required “pro clima” shipment labels.